Image Politics is an artistic and political campaign that engages with the image's potential as a political weapon. Over the last 20 years the image has served obediently in the marketing of lifestyles and warfare. With the final collapse of the political public sphere since 11th September 2001 it has become almost impossible to establish counter images against this visual bombardment, which has functioned as an integral part of the so-called War on Terror. With Image Politics we address the bombardment through the visual arts, film and theatre. Image Politics is an exhibition, film series, theatre piece, seminar and publication organized by visual artist Jakob Jakobsen. Image Politics runs from February 12 to April 22 2010. 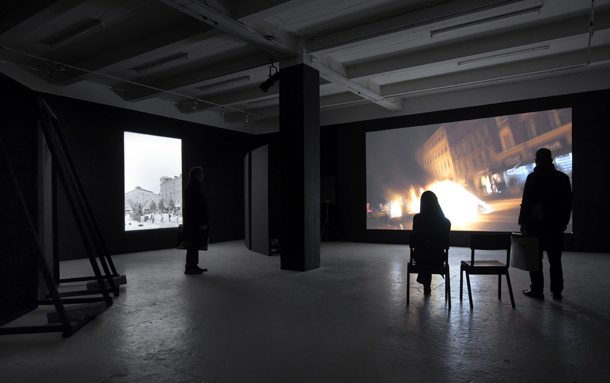 The exhibition was based on a narrative of 25 minutes in which the audience was led through the show by two voices, shifting lights and video projections. The space was turned into a black box and the narrative was structured as a tragedy with a protagonist and a chorus. The chorus was the 'voice of death' as Nietzsche called it and the protagonist's belief in political action, held throughout the narrative, could in the end not be maintained. The material of the show, the images and the video recordings, were accumulated material collected over the years through my political activities. The exhibition was a spectacle based on a montage of material previously used for strictly political ends. Additional images of the exhibition. Opening night Thursday March 11 2010. Then on March 18 and 25 and April 8, 15, and 22. The Royal Theatre has invited me to direct the second act of the play KAFAK - based on Kafka 's writings and directed by playwright Anders Paulin. I was asked to make a proposal for the second part of the play, and I have decided to invite the audience on aguided bus tour of the Nørrebro neighbourhood from Mjølnerparken past Brorson Church to the Blågård Square. The actors from KAFAK-show will act as guides and they will read a text with testimonials from Nørrebro written by an author collective consisting of local people from Nørrebro, immigrants, activists, criminals and other citizens. The text will not make any positive assumptions of the controversial neighbourhood and neither will it confirm the media's distorted image of the conflicts of the area. The tour will at once be a fantastic and terrible journey through the darkness. April 7, 8, 14 and 15 2010. The film series presents four film programs at the Cinematheque in Copenhagen that all draw critical pictures of Denmark as a nation. The starting point of the program is the movie 'Aftenlandet' (The Evening Land) by the English filmmaker Peter Watkins, which was produced in Copenhagen in 1977. The film is a pseudo-documentary, which depicts how the Danish society due to a combination of political events develop into a fascist state. When the film was finished in 1978 the Danish Broadcast Corporation refused to show the film and it was only shown a few times in the cinema Grand in Copenhagen before going into oblivion. Peter Watkins has since become known as one of the most controversial and uncompromising political filmmakers. Other films that challenge the image of Denmark, 'Denmark A + B', 'Five Days of Peace', 'AFR', and finally the current 'Confrontation in Copenhagen ' produced by and shown on Al Jazeera in autumn. The film was intended for the Arab public and depicts a Denmark marked by racist gang war and right wing politics. The four film programs will be introduced by the directors or people who have been involved in the production of the film. A more detailed program (in Danish) with videos of the introductions can be found in the film section of the site. Since September 11 a new visual landscape has emerged following the wars in Afghanistan and Iraq. As a part of the so-called War on Terror a visual bombardment threatens to leave us with still fewer counter-images and resistance-strategies. Censorship of the media and control of the public sphere has become the order of the day. But the images from the Abu Ghraib prison show that despite a tightly managed visual regime, images that disturb the tightly managed control of representation of the war do still appear. The seminar's main focus will be the image politics during the War on Terror combined with an attempt to pick up on new modes of resistance and production of counter images emerging from subcultural groupings around the world. Speakers include Iain Boal/Retort (US/Ir), O.K. Werckmeister (Ger), AW (DK), Curatorial Action (DK), Madeleine Bernstoff (Ger) and Rune Eltard (DK). Organised by associate professor Mikkel Bolt (art historian), University of Copenhagen, professor Nils Norman (visual artist), The Royal Academy of Copenhagen, and professor Jakob Jakobsen (visual artist), Funen Art Academy and the students from these departments. Venue: Folkets Hus Stengade 50, Nørrebro, Copenhagen Time: Saturday April 10 at 10am to 6pm - food/social in the evening Sunday April 11 at 11am to 6 pm. Time: Saturday April 10 at 10am to 6pm - food/social in the evening Sunday April 11 at 11am to 6 pm. A more detailed introduction can be found in the seminar section of this site. with red paint inside the parliament by anti-war protesters in 2003.